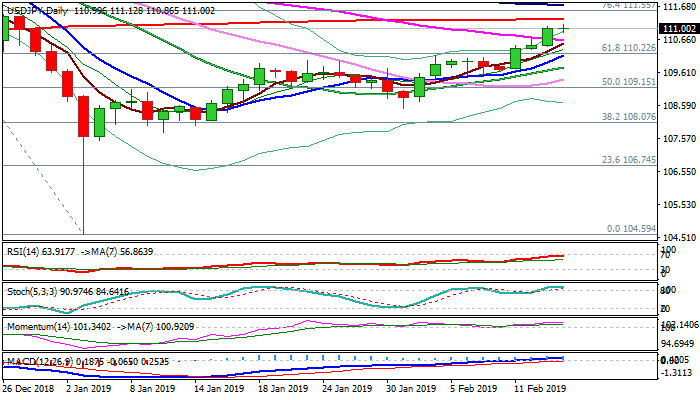 The pair consolidates around 111 handle following strong advance in past three days and remains bid for attack at 200SMA (111.28), violation of which would expose nearby barriers at 111.40 zone (late Dec high); 111.55 (Fibo 76.4% of 113.70/104.59) and 111.40 (100SMA). Optimistic tone over US/China trade talks (President Trump signaled possible 60-day extension from 1 Mar deadline) underpins the action Bullish techs also support, but strongly overbought stochastic (not firmer reversal signal yet) warns that bulls may face strong headwinds here. Dip- buying would be favored while corrective dips hold above 110.20 zone (broken Fibo 61.8%, reinforced by rising 10SMA).